Hello there and welcome back to Market Days, where I share whatever flowers are in season and available at the flower market in my hometown. This month I am highlighting sunflowers, a typical summer flower, bright and cheerful and with an unmistakable resemblance to the sun. I know the days start to get shorter and a little bit chillier, autumn is definitely in the air, but I’m not ready to let go of summer yet. 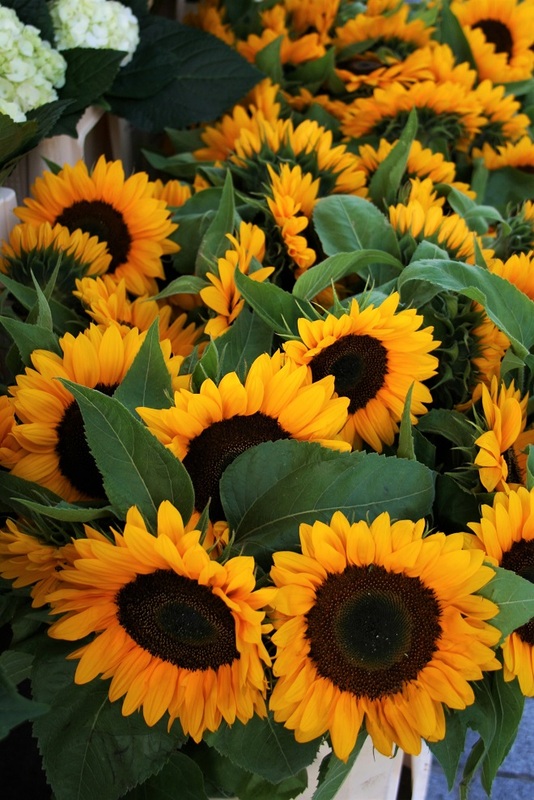 So why not get a bunch of sunflowers for the weekend and bring some sunshine into your home? I’m not a huge fan of yellow flowers, but I do love sunflowers in a vase. 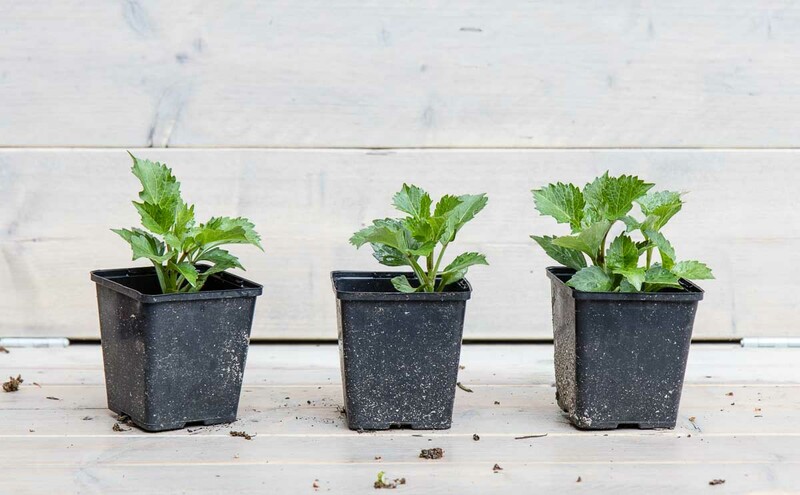 I planned to grow some in my allotment but forgot to put the seedlings into the garden, and then it was too late. Luckily, you can get plenty of sunflowers at the market. When it’s hot, stay out of the sun! Their botanical name is Helianthus, from the Greek words ‘helios’ which means sun and ‘anthos’ which means flower. In French they are called tournesols and in Italian girasoles, which both mean something like turn to the sun, because the buds of the sunflower track the sun on its journey along the sky from east to west. Lots of people think sunflowers always turn towards the sun, but once the flowers are fully open, most sunflowers face east. The sunflower originates in the Americas where it was domesticated and grown for food. The indigenous people worshipped the sun, temples were decorated with golden sunflowers and priestesses wore crowns made of sunflowers. At the beginning of the 16th-century, Spanish conquistadores brought the sunflower to Europe and now a field of sunflowers in the Provence looks like a typical French landscape to us! 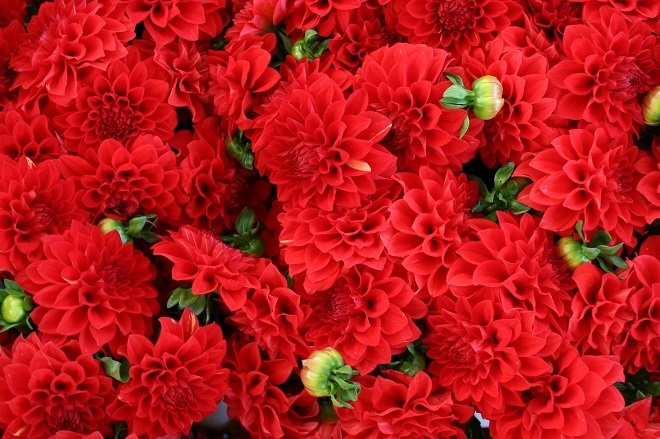 The dahlia was also brought to Europe by Spanish explorers, I should send them a thank you note. 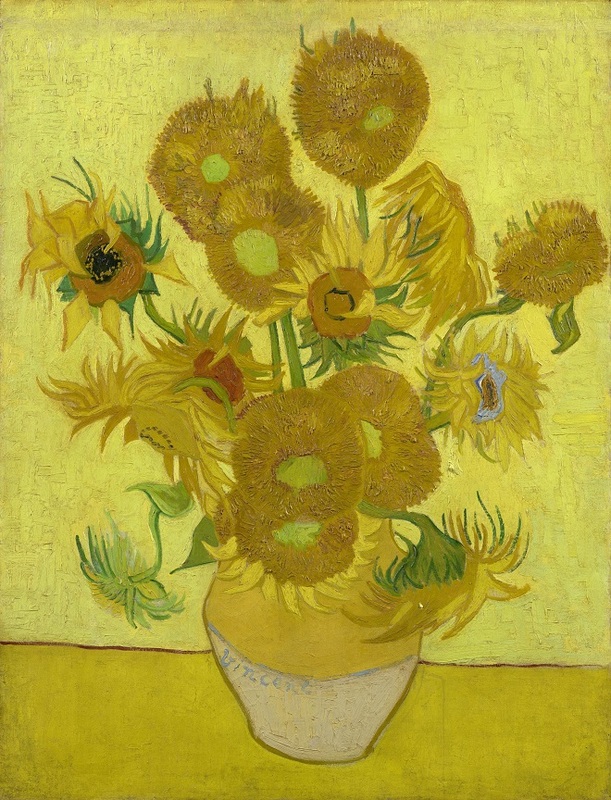 The sunflower is also strongly associated with Vincent van Gogh, his sunflowers are among the most famous paintings in the world. He painted two series of sunflowers to decorate the room of his friend and fellow artist Paul Gauguin, who he invited to stay with him in the south of France. The paintings are now spread across the world, there is one in the Van Gogh museum in Amsterdam. Because it is 125 years since Vincent van Gogh died, 2015 has been named “Van Gogh Year”. This weekend, the Van Gogh museum will celebrate the opening of a new entrance hall by building a labyrinth of 125.000 sunflowers on the square in front of the museum. If you are in Amsterdam this weekend, I think this will be a great event to visit. 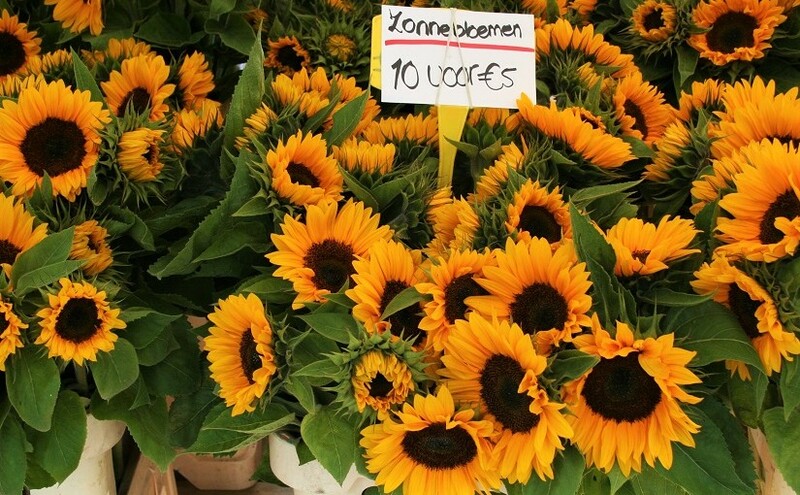 And if you haven’t gotten around to buying sunflowers, all the flowers will be handed out to the public during the afternoon of Sunday 6 September, between 4 and 6 pm. 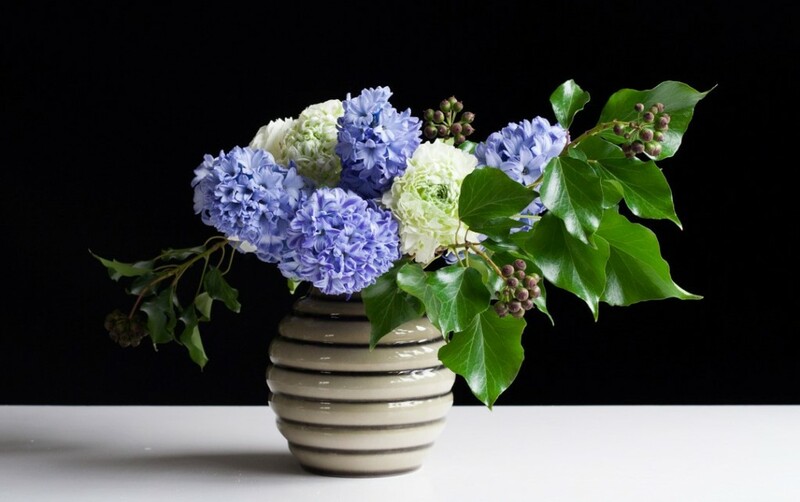 Another Van Gogh related event this weekend is the flower parade in Zundert, a small town in the Netherlands and Vincent van Gogh’s birthplace. The annual parade is claimed to be the world’s largest flower parade and consists of 20 giant floats, completely covered with … dahlias! 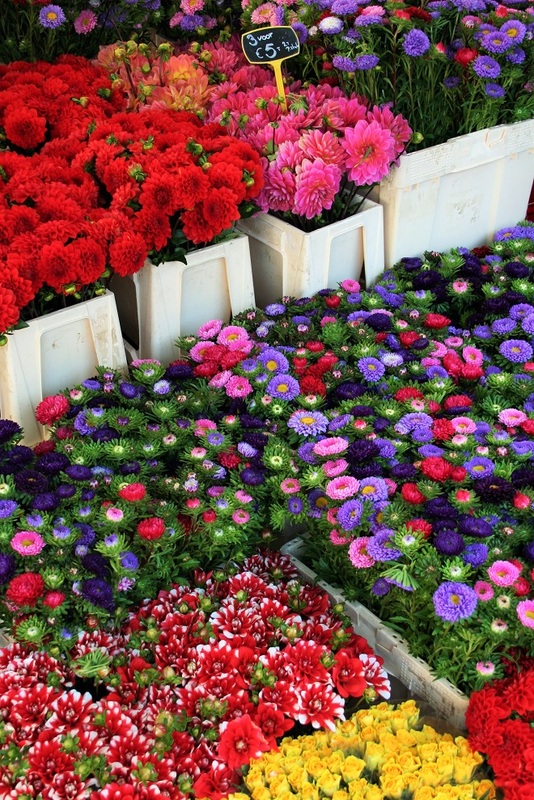 Colourful dahlias and straw flowers at the flower market. Zundert’s village districts and surrounding church villages compete each year to build the best float to be judged by a jury. The spectacular floats are made with eight million dahlias grown especially for the flower parade. The residents of Zundert, all volunteers, spend all summer building the floats. Because the dahlias have to be fresh, they can only be applied onto the float in the last three days before the parade, a very stressful few days! Because of the Van Gogh Year all floats will be dedicated to Vincent van Gogh. You can see last year’s floats over on Corso Zundert. 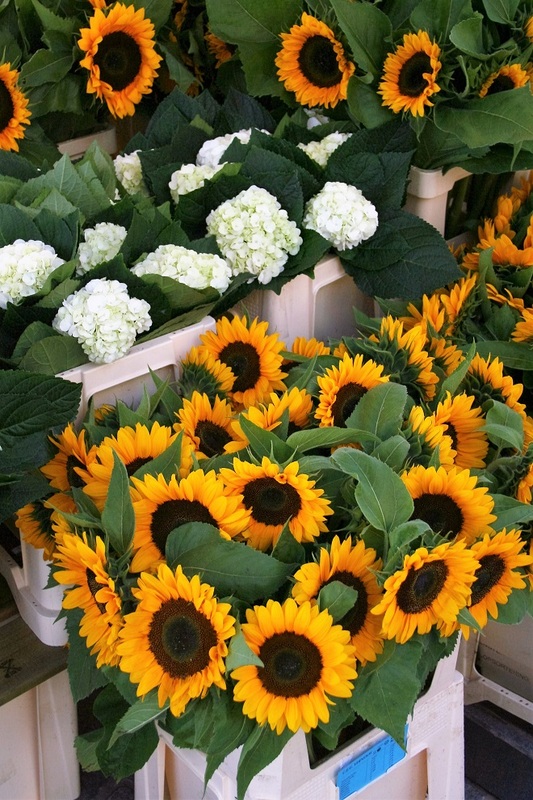 Enough reasons to get some sunflowers for the weekend, and maybe add in a few dahlias, don’t you think? 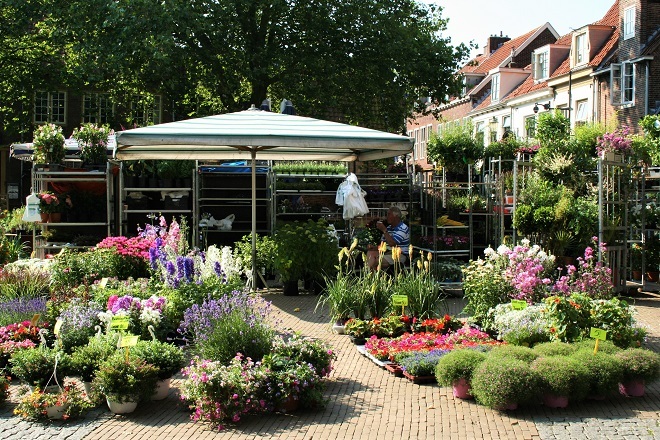 When I wrote about the flower market two months ago, we were getting ready for our summer holiday. 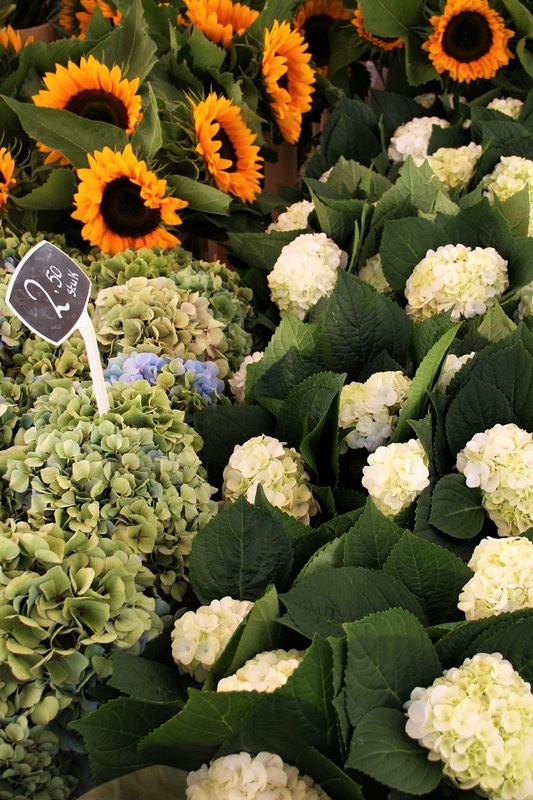 I had big plans of maybe writing a post about the Italian flower market. But then our car broke down in Austria, we had to change our travel plans and when we finally reached Tuscany it was so hot, even the sunflowers in the fields looked exhausted. Honestly, I didn’t see many flowers. I hope you enjoyed this month’s post anyway! 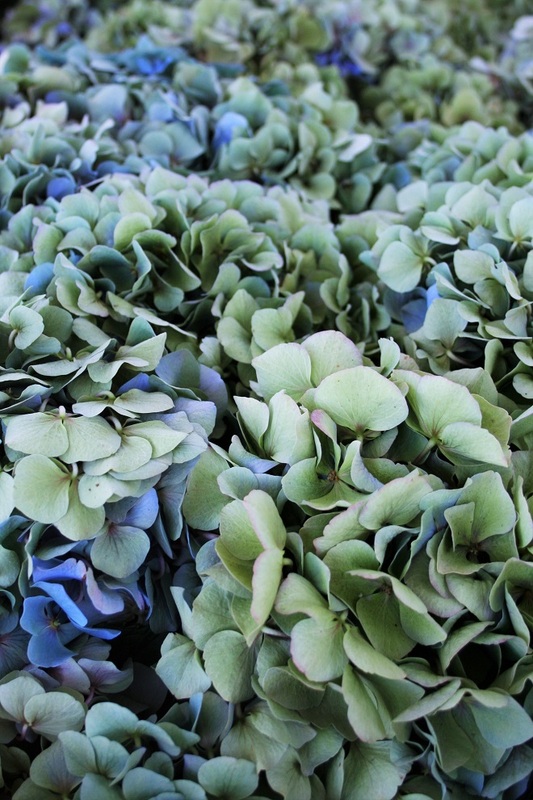 Do you want to see the changing of the seasons and find out what flowers are available at next month’s flower market? I would love for you to follow along with me! Subscribe to my email list to get updates delivered right to your inbox. 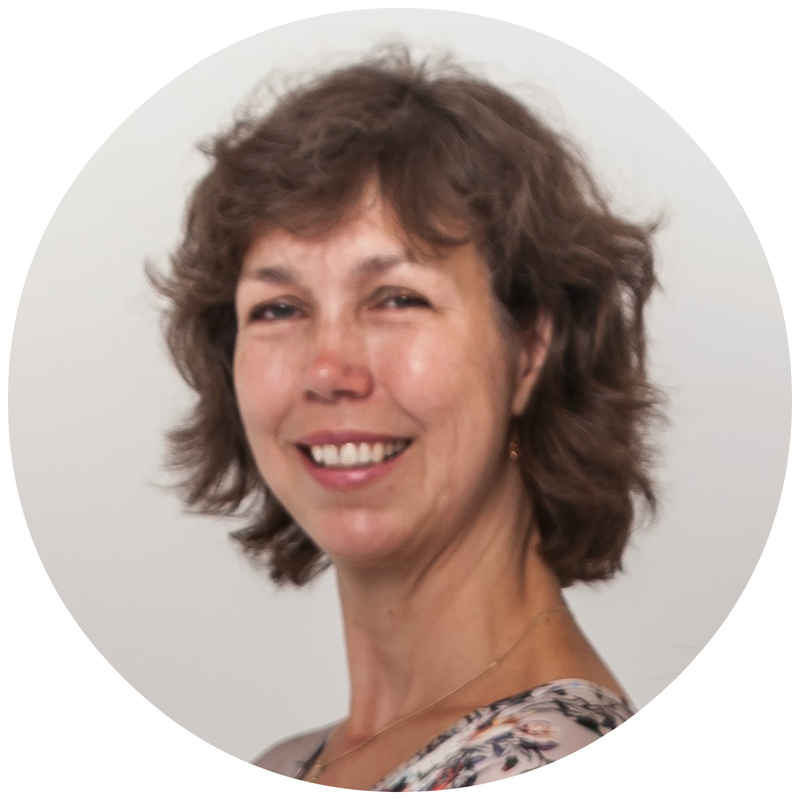 Mooi verhaal Pauline, ook ik heb hier een grote bos zonnebloemen staan om de zomer nog een beetje vast te houden. 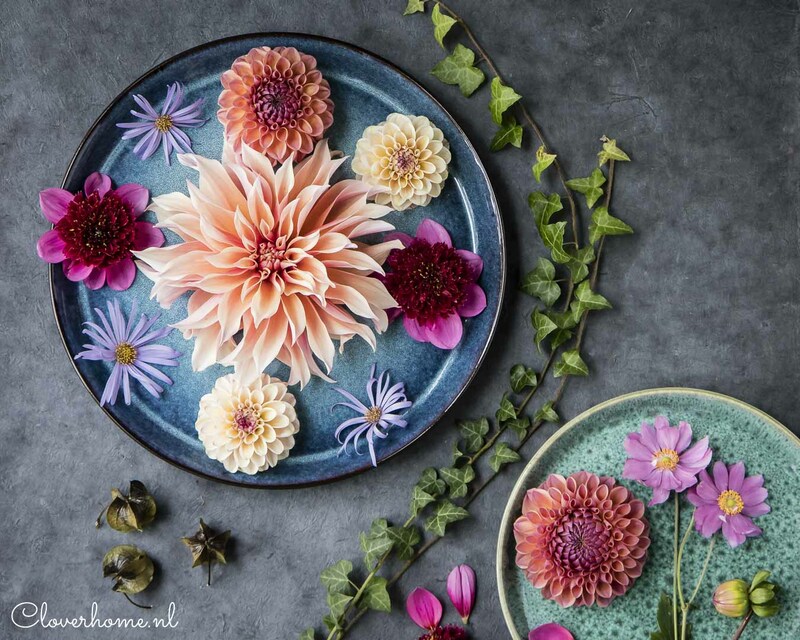 Ondanks de regen is de tuin nog kleurig met witte en roze Anemonen, Rudbeckia fulgida Goldsturm, zijn net kleine zonnebloemen, en heel veel Fuchsia’s. Fijn dat de tuin er nog zo mooi bij staat, we krijgen vast nog een paar mooi nazomerdagen!